This unique Vapor Boot by Giddyap Girls is designed to be used with Chlorine Dioxide Gas products. As you know Chlorine Dioxide is highly effective in the treatment of: White Line Disease, Thrush, Skin Fungus and Hoof Rot. Chlorine Dioxide has been demonstrated to be bactericidal, fungicidal, virucidal, and sporicidal while remaining harmless to healthy tissues. 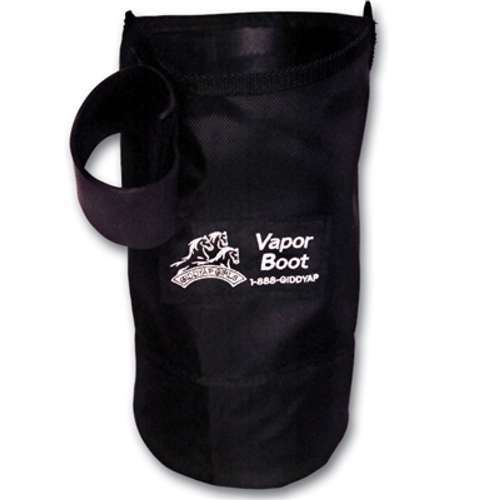 The Giddyap Vapor Boot is constructed of premium grade ballistic Nylon that is extremely durable. 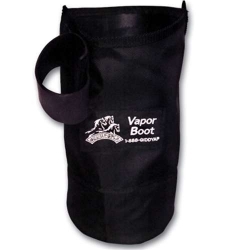 The Vapor boot has a hi-density non-permeable waterproof interior, a gusseted closure that is secured by a flexible neoprene SnugSel strap to help support and fasten, and a removable rubber disk that gives structure to the boot and stability to the horse.